For over a century, Los Angeles has famously siphoned its water from mountain streams hundreds of miles away. 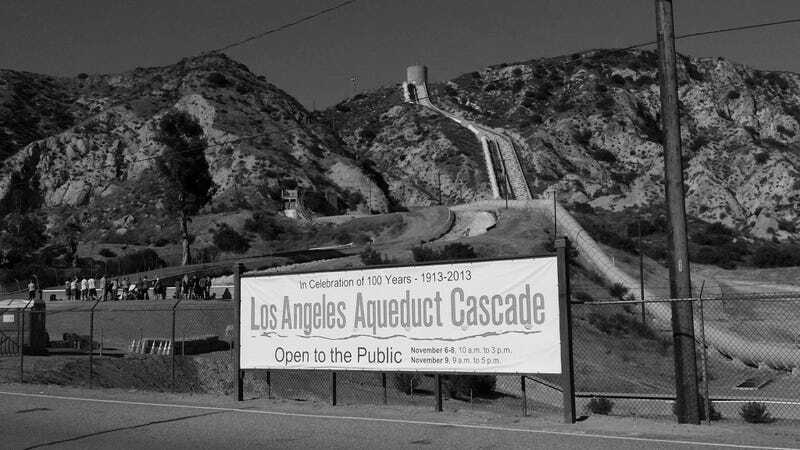 Now LA believes that it can wean itself off its many aqueducts, and has approved a 25-year plan to do exactly that. A new strategic plan from LA’s Department of Water and Power claims that by 2040 the city will get more than half of its water from local sources. That goal seems outrageous when you consider that in the early 1900s the relatively tiny city of LA decided the only way to solve its water problems was to ship it from 300 miles away. But with a looming drought, that melting snowpack is no longer reliable—it’s currently less than 10 percent of normal for this time of year. It’s time to think local and long-term. In fact, Southern California gets quite a bit of rain, even though it usually all falls around the same time of year. And the region also has plenty of natural aquifers that hold water underground. So the key is to capture and store rainwater, instead of letting it escape out into the ocean, something that recent infrastructure projects have been trying to fix. There’s a saying that rain falling in LA’s mountains will reach the ocean faster than a car can drive the same distance. The entire city is engineered to flood and flush, when it can be easily redesigned to filter and absorb. This doesn’t just mean capturing rainwater from rooftops to store in cisterns, but also changing LA’s surfaces so rainfall is able to recharge all its groundwater basins. In addition to more permeable streets and parking lots, the city will also add “spreading grounds,” basically giant fields of vegetation which act like giant sponges to trap and naturally clean runoff. The city also installed a large treatment plant at the mouth of the Los Angeles River to capture and clean water before it’s lost to the Pacific Ocean. It sounds great in theory, but won’t LA grow over the next 40 years, making this plan impossible because the city will need much more water than it does today? The way LA’s relationship with water has already changed might surprise you. Actually, LA uses less water now than it has in almost any time in the last 40 years even though the city’s population has swelled. And with the right conservation measures in place, plus incentives for drought-tolerant landscaping and rain barrel installation, LA could probably be saving even more water.